On today's show, Pat finally lands his white whale as 6X Pro Bowler, 2X NFL MVP, and Super Bowl XLV Champion, Aaron Rodgers joins the show for an incredible conversation. They chat about his expectations for the coming season, whether or not coming back from injury makes him appreciate the game more, his thoughts on the new helmet rules and how it affects play, what he likes to do to have fun, and how he expects his contract negotiations to play out (44:20-1:01:24). The guys also do another deep dive on this week's Hard Knocks episode including everything they loved about it, and the emergence of possibly the greatest character in Hard Knocks history, O-Line coach Bob Wylie. Also joining the show is VP of Production for HBO Sports and Senior Producer on Hard Knocks, Dave Harmon. He gives everyone a look behind the curtain of Hard Knocks and discusses what goes into making the show, whether or not the producers make any suggestions for content, if the Browns have final cut and get to choose what gets omitted from the episode, and he gives his opinion on who the best character on Hard Knocks has been (20:00-39:12). Today's a great one. Come laugh with us, cheers. On today's, Pat and the crew sit down with four different guests for a couple of incredible conversations. First, 2X Pro Bowler, 3X Super Bowl Champion, and host of The Stinkin' Truth Podcast, Mark Schlereth, joins the show. They chat about his outlook on his kids and grandkids, internet trolls coming after his bench press form, what he expects from the Denver Broncos this year, what it was like playing with and hanging out with John Elway, how he thinks given the rules, he could play in the NFL still, and he gives an incredible take on CTE from a players perspective (2:41-23:29). Next, adult film icon, SiriusXM host, and fantasy sports expert, Lisa Ann calls into the show. They discuss how she got into the adult film business, what she thinks about Jimmy G going on a date with a pornstar this offseason and what the protocol for that is, what she's doing to help younger stars in the industry, and she highlights some of her favorite fantasy sleepers for the upcoming NFL season (26:43-42:53). Later, NFL Insider, Ian Rapoport joins the show. He gives some updates on the Aaron Donald contract situation, how he cultivates sources, if he's ever been burned by a source to the point of ex-communication, what the biggest news story he's broken in his career has been, and he looks ahead to the NFL season (49:19-1:01:41). Lastly, coming off a bareknuckle boxing victory in Biloxi, Mississippi, UFC legend Chris "Lights Out" Lytle joins the show. He talks about his experience competing in a bareknuckle boxing event for the second time, how little he knew about his opponent going in, whether he thinks that promotion can compete with the UFC, his mindset while in the ring, and he looks ahead to his next bareknuckle fight (1:04:47-1:21:23). As always, Nick selects a couple of Friday Bangerz to help send you into the week in fantastic fashion. Come laugh with us, cheers. On today's show, Pat is joined by Digs, Nick, Todd, and Zito has they break down everything that happened in the 4th episode of Hard Knocks including Todd Haley disrespecting The Brand, whether or not Tyrod Taylor is feeling the heat with Baker Mayfield at his heels, Myles Garrett loving jazz music and dismantling offenses, and Mychal Hendricks going after his former teammates (and subsequently being indicted on insider trading), and everything else you need to know about the Cleveland Browns. Also joining the show is 8X Pro Bowler, 4X 1st Team All-Pro, former Defensive Player of the Year and Defensive Rookie of the Year, and newly minted Hall of Famer, Brian Urlacher. They chat about his Hall of Fame experience and why he was nervous leading up to it, some of his craziest locker room gambling stories, what he thinks of the Bears as they seek to discover a new identity, what he's been up to since he retired, and who he thinks is going to be the best team in the NFL this year, and who is going to underperform in an absolutely hilarious interview (30:13-50:11). Later, sports marketing agent Darren Prince, whose clients have included Magic Johnson, Muhammed Ali, Joe Frazier, Dennis Rodman, and many more, joins the show to promote his new book, "Aiming High." He chats about how he was instrumental in setting up Dennis Rodman's trip to North Korea to meet Kim Jong Un, how he got started in the sports marketing business, his struggles with alcohol and opioid addiction and what he's doing to combat it now, and what he thinks the defining moment in his career thus far (53:39-1:09:04). After the show, stick around for a throwback Thursday comedy clip of Pat retelling the infamous Peyton Manning "bet on Red 18," story. It's a good one. Come laugh with us, cheers. On today's show, Pat is joined by Nick, Digs, Todd, and Zito as they recap what happened over the weekend, including Pat wondering if the Patriots might be in trouble this year after a couple of lackluster showings into the preseason, and Tom Brady's recent drama with ending an interview with WEEI's Kirk & Callahan after being asked questions about his fitness guru, Alex Guerrero. Pat also recounts his hilarious time at a Pentecostal church over the weekend and witnessing the pastor delivering the Holy Spirit to people first hand. Also joining the show is the CEO of The Sports Entertainment group and the agent of Le'Veon Bell, Adisa Bakari. They chat about working to get Le'Veon a new deal during the offseason, how exactly the franchise tag works in this particular situation and what will happen if the Steelers try to franchise him again, if time off during the preseason has hurt his market value, what he thinks about Le'Veon's rap career, and he talks a couple of the potential teams interested in Le'Veon if they are unable to work out a deal with the Steelers (23:19-40:53). Later, IndyCar and now NASCAR driver and friend of the show, Conor Daly, calls in to talk about his crazy weekend involving being dropped by his chief sponsor, Lilly Diabetes, what it was like getting behind the wheel in a NASCAR and how it differs from driving an IndyCar, and what his plans for the future are with this season coming to a close (43:32-53:50). Come laugh with us, cheers. On today's show, Pat is out of town on another top secret business meeting, but we've still got two incredible interviews to cap off the week. First, 2X Pro Bowler and one of the best TE's in the NFL, Kyle Rudolph, joins the show. They discuss how the Vikings have looked so far in the preseason with Kirk Cousins at the helm, what it's been like adjusting to new offensive coordinator John DeFilippo's system, whether or not Mike Zimmer is really as hard-nosed as he seems, how he thinks Teddy Bridgewater is going to fair with the New York Jets, and if Notre Dame football is ever going to be any good again (8:56-21:43). Next, former Head Coach of the Arizona Cardinals and interim Head Coach for the Indianapolis Colts and current broadcaster for CBS, Bruce Arians, joins the show for another electric conversation. They chat about how he's adapted to not coaching football and what CBS has been doing to prepare him for his first gig when the Browns and Steelers square off week 1, whether or not he's going to have trouble not going after refs, how much he thinks the new rules are going to impact the game, and who the best athlete he's ever coached is (25:19-38:10). To close out the show, the guys each pick a Friday Banger to help send you into the weekend. Come laugh with us, cheers. On today's show, Pat is joined by Todd, Digs, Nick, and Zito as they cover everything that happened over the weekend including Pat's crazy couple of days in Brooklyn for NXT Takeover and a hilarious story about The World's Strongest Man, Mark Henry, having to carry him home from Times Square. They also cover Josh Gordon returning to the Browns and what his absence could have possibly been, and they dive deeper into the new helmet rule and how it may be ruining the NFL. WWE Superstar Bobby Lashley also joins the show for an incredible conversation. They chat about his road to the WWE, how being the victim of a botched bank robbery ended his Olympic wrestling career and started his sports entertainment career, how he keeps his body looking the way it does, and Pat gives him a few pointers on how to grow his social media brand (41:42-1:06:57). Later, current Smackdown Women's Champion and one of the biggest stars in the WWE, Charlotte Flair, joins the show. They chat about what it's been like establishing herself in her father's shadow, how trying to save her brother's life got her into the wrestling business, and what its been like being at the forefront of the women's evolution movement in the WWE (1:07:31-1:15:09). It's a good one. Come laugh with us, cheers. On today's show, Pat, Digs, Todd, Nick, and Zito discuss Lavar Ball's recent comments about Lonzo and LeBron coexisting together in Los Angeles, they cover Hue Jackson's recent comments that Drew Stanton will be the backup quarterback ahead of Baker Mayfield and whether or not that's a good decision, Pat explains how he's started to love cooking and how that differs from where he used to be as well as wondering how he can be on a meat exclusive keto diet and lose the same amount of as a vegan. Pat also breaks down the current animal situation in his house, they battle some adversity as more construction goes on directly behind the studio, and Pat breaks down one of his favorite shows on TV, America's Got Talent. Later, cohost of the Around The NFL podcast, NFL Network analyst Chris Wesseling joins the show. They discuss his recent article about Jon Gruden and Martavis Bryant's relationship and whether or not the Raiders are going to be any good, who some of his picks for surprise team in the NFL this year is, his thoughts on this season of Hard Knocks so far, and he breaks down his path to writing for the NFL and chats about recently becoming cancer free (38:20-50:01). As always, Nick selects a couple of Friday Bangerz to help send you into the weekend. Come laugh with us, cheers. On today's show, Pat, Digs, Nick, Todd, and Zito cover everything going on in the NFL including Pat doing a complete 180 on his thoughts about the Browns after watching the 2nd episode of Hard Knocks. The guys are also joined by a trio of incredible guests to talk all things NFL. First, Mike Florio of Pro Football Talk joins the show to talk about his article on how the Browns are dealing with Antonio Callaway getting pulled over with a suspended license and weed in his car, and his thoughts on Jalen Ramsey taking shots at almost every quarterback in the NFL (33:08-48:06). Next, Super Bowl Champion, 2x Pro Bowler, and one of the best kickers in the league, Justin Tucker of the Baltimore Ravens joins the show. They chat about how his training camp has been so far, how singing opera and football are similar, whether or not he's superstitious before kicks, what he thinks of some of the rule changes and how they'll affect kickers, and what he thinks of fantasy football (50:28-1:08:50). Lastly, former offensive lineman and 2nd round pick of the Indianapolis Colts, Jack Mewhort, calls in to discuss what he's been doing since he retired, how one of his mistakes started one of the greatest field goal streaks in NFL history, whether or not he's worried about CTE down the road, and what he's going to miss most about playing football (1:12:46-1:21:18). It's a good one. Come laugh with us, cheers. PMS 208 - "I Smell Weed In The Car"
On today's show, Pat, Todd, Nick, Digs, and Zito are live from training camp with the Indianapolis Colts with a couple of incredible football conversations. Joining the show first is Colts GM Chris Ballard, new Head Coach Frank Reich, and 4x Pro Bowl WR T.Y. Hilton to discuss everything that has been going on so far in training camp, what the Colts plan on doing with all of their cap space, who some of the standout rookies have been so far in camp, how Ballard and Reich have tried to create a new culture and identity in Indianapolis, whether or not they like Andrew Luck's mustache, and more (2:25-21:52). Later, 4x Super Bowl Champ, the greatest kicker who has ever lived, Adam Vinatieri, joins the guys on set. They discuss whether or not he ever gets nervous anymore, how camp changes from year to year, what it's like having his son out on the field being a ball boy, he chats about one of his passion projects, Record Breaking Ranch, his new all-inclusive hunting cabin in Missouri, what he plans on doing once he's retired, and which team he will decide to be inducted into Canton with (25:58-54:13). Come laugh with us, cheers. On today's show, Pat is joined by Nick, Todd, Zito, and everyone's favorite Canadian, Gump, is with the fellas in studio. They cover how Gumpy went from caller on The Pat McAfee Show to being pals with everyone at the Heartland, how his travel into Indianapolis was, and the guys talk a little preseason football. Also joining the show is former Colts, Cardinals, and Ravens cornerback Jerraud Powers to chat about what he's been doing in his time off from football, he recalls Pat getting ready to play quarterback in an actual NFL game, he gives his opinion about the new NFL rules and whether he likes them or not, and questions whether Pat is achieving his Caucasian Rock look naturally (4:42-22:52). Later, NFL reporter Steve Wyche joins the show to discuss everything going on around the NFL. They cover Andrew Luck's comeback, the Leveon Bell/Steelers situation, who some of his teams to look out for are this upcoming season, what he thinks about the Browns and Hard Knocks, and why no one ever talks about the Saints (28:01-45:11). To close out the show, Gump helps Nick select a couple of Friday Bangerz to help send you into the weekend. Come laugh with us, cheers. On today's show, Pat is joined by Nick, Digs, Todd, and Zito as Pat breaks down everything there is to know about the Browns and what he thinks of them after watching the first episode of HBO's Hard Knocks. He dives into what he thinks about Hue Jackson, Todd Haley, Jarvis Landry, Baker Mayfield, and gives his thoughts on what the Browns will be doing this upcoming season. Also joining the show is former Iowa Hawkeye legend and middle linebacker for the Indianapolis Colts, Pat Angerer, for an incredible conversation. They chat about what he's been doing since he retired from the NFL, his concussion and injury issues and what he thinks of the direction of the new NFL, how much he got made fun of for being a white guy, and he tells an absolutely hilarious story about a naked locker room brawl he was involved in and Pat witnessed (52:52-1:14:40). It's a good one. Come laugh with us, cheers. On today's show, Pat is joined by Nick, Digs, Todd, Zito, and Jourdyn to recap everything from Rough 'N' Rowdy 4 in Youngstown, OH including all the best moments from Bill Burr to the fights themselves and a recap of Pat's electric night on the microphone. Pat also does a deep dive into the newest Avengers movie and tries to make sense of it all after watching it over the weekend, and the guys chat about Last Chance U, and how it shares some parallels with Pat's West Virginia experience, and how it shines a light on some of the issues with the NCAA. Also joining the show is former Patriots 2nd round pick and Colts cornerback/safety, one of the smoothest athletes alive, Darius Butler for a great conversation. They cover what he's been up to while being a free agent, he educates the people about what his job was on the football field, how he feels about all the helmet/concussion issues and new rules, and whether or not he's considered joining one of the many new professional basketball leagues (47:26-58:45). Come laugh with us, cheers. On today's show, Pat is joined by Digs, Todd, Nick, and Zito as they share their favorite news stories of the week including Tiger vs. Phil over Thanksgiving weekend in Vegas, the NFL returning with the Hall of Fame game, how getting cheated on can actually be beneficial financially, and Matt Damon and Ben Affleck making a movie about the McDonald's Monopoly scandal. Stopping by in studio is Bellator Heavyweight Grand Prix favorite Matt Mitrione and former UFC legend and current bareknuckle boxing championship contender, Chris Lytle for an incredible chat with the guys. They cover Mitrione's recent bender in Vegas, what he and Lytle have been doing training wise for their respective fights, what the difference between an NFL training camp and a fight camp is, and each guy gives an insight into their upcoming fights (19:48-43:30). As always, Nick selects some Friday Bangerz to help send you into the weekend. After the show, stick around for a couple of interviews with two of the marquee fighters featured on this weekend's Rough 'N' Rowdy card. First, Barstool blogger Pat McAuliffe joins the show to talk about his matchup in the main event on the card, a little bit about his training regimen leading up to the fight, and what he did prior to joining Barstool. Next, former Youngstown police officer, Ryan Young, joins the show to discuss his situation and the scandal he's been involved in leading up to the fight, what his prediction for the fight is, and what he plans on doing after Rough 'N' Rowdy (1:01:51-1:32:15). Come laugh with us, cheers. On today's show, Pat is joined by Todd, Digs, Nick, and Zito as they turn their attention towards the start of the NFL season in an episode heavy on NFL talk. First, former scout for the Eagles, Ravens, and Browns, analyst for NFL Network, and current LA Chargers color analyst, Daniel Jeremiah joins the show. They cover everything going on at training camp and some of the players he's most excited keeping an eye on, what he expects from this NFL season, and who his contenders in the AFC and NFC are in an interview that covers everything you need to know about the coming NFL season (8:30-24:40). Next, 4x Pro Bowler and former offensive lineman for the St. Louis Rams, Miami Dolphins, and Buffalo Bills, Richie Incognito joins the show in an absolutely wild interview. They chat about his recent run in with police that was all over TMZ, whether or not he really plans on pursuing a career in politics, he does a deep dive and gives his side of the Jonathan Martin situation and how it affected everything, and he explains what he's been up to these days (38:06-1:00:31). It's a good one. Come laugh with us, cheers. On today's show, Pat is back from vacation in the Bahamas and is joined by Todd, Nick, Zito, and Jourdyn to chat about what they did with their time off. They also cover the McDonald's Monopoly scandal, Alex Trebek's upcoming retirement from Jeopardy! and Pat recommends a couple of documentaries that he watched while on vacation. Also joining the show in studio is Colts linebacker Najee Goode on his day off to discuss how the things have been going from Colts training camp, whether or not Andrew Luck is really back, and who some of the standouts have been so far (49:52-1:07:21). Come laugh with us, Cheers. 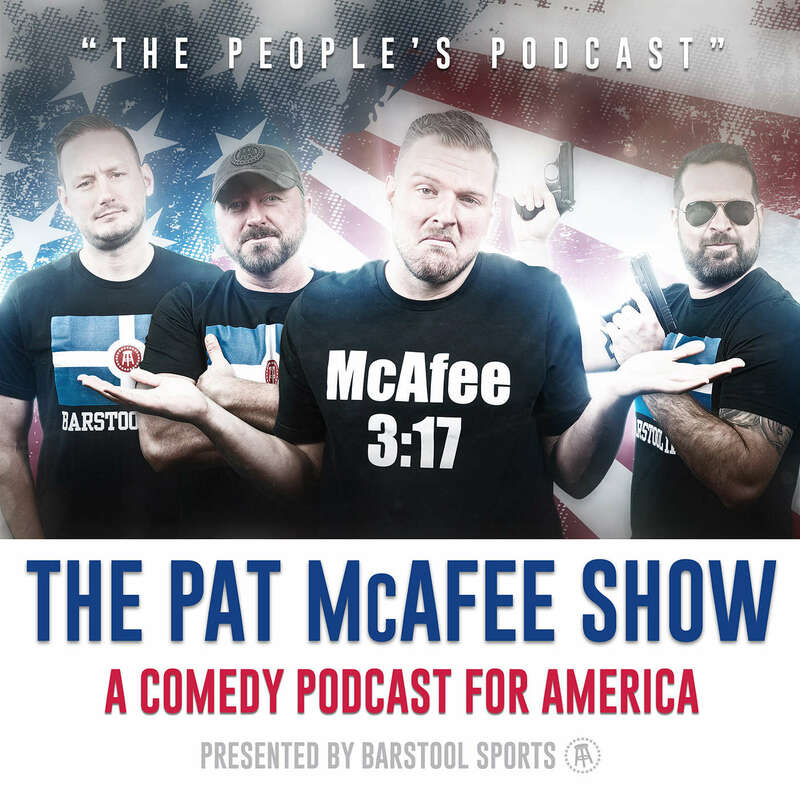 On today's show, Nick fills in for Pat and selects some of his favorite stories and interviews from the first 199 episodes of the Pat McAfee Show. He selects a couple of classic stories including Pat's hilarious NFL Draft Day story that inevitably changed everything (2:21-10:19), and one of the original Behind The Badge stories where Todd tells the now infamous chicken story (29:10-37:23). Also included is an interview with Big Cat and PFT Commenter of Pardon My Take where Pat and Big Cat's relationship is explained a little more and how Pat details how he eventually found himself working for Barstool (13:03-26:00). Nick's final selection is the incredible interview Pat did with the most clutch athlete of all time, the GOAT, Adam Vinatieri, in their first extended conversation since Pat's retirement. They cover what it was like being teammates, how Vinny reacted to Pat retiring, and Pat tells his favorite Adam Vinatieri story of all-time detailing his kicking battle with Matt Stover while Vinny was injured (41:17-1:16:48). As always, Nick picks a couple of Bangerz to help send you into the weekend the right way. Come and laugh with us, cheers. On today's show, Zito fills in to choose his favorite moments from the Pat McAfee Show while Pat is on vacation. He selects a couple of his favorite segments including the episode that birthed the Kim Jong Update and broke down Pat's interview style with guests, Pat's incredible rant about Simpson's creator Matt Groening being a time traveler, and the infamous Chuck Pagano press conference from episode 60. Zito also chooses two of his favorite interviews to close out the show. First is Pat's hilarious conversation with arguably the funniest man in Hollywood, Seth Rogen. They chat about his creative process, his favorite ways to smoke, and how he got to the position he's in right now (25:21-37:54). Last is the incredible conversation with comedy legend, "The Machine," Bert Kreischer. They cover his insane life, starting with being the genesis for the film, "Van Wilder," his story about becoming "The Machine," in Russia, his relationship with Will Smith, and his wild night out with Tracy Morgan (39:52-1:04:25). Come laugh with us. Cheers. Pat's on vacation this week, so on today's show, Todd fills in and selects his favorite moments and interviews from the first 197 episodes of The Pat McAfee Show. Todd's first pick is an interview with Barstool Sports founder, Dave Portnoy. Pat and the guys sit down with Dave and discuss how he created Barstool Sports brick by brick and how it has started to evolve over the last 10+ years. They also chat about Dave's love for horses, what it's like owning a racehorse, his gambling habits, and some of the controversies he's be in over the years (4:07-34:35). Todd's next pick is Pat's hysterical interview with one of his old coaches and former head coach of the Arizona Cardinals, Bruce Arians. They cover what it takes to be a great NFL quarterback, Bruce's philosophy towards refs, what it was like coaching Andrew Luck during his rookie year, and he shares some other hilarious stories (37:34-55:05). Todd's final pick is the incredible in-studio conversation with country superstar, Chase Rice. Pat and the guys go inside his creative process as Chase samples a demo off his upcoming album, they chat about what he does when he's not touring, how he got to this point in his country music career, and what he's got coming up in the future (58:56-1:22:28). Come laugh with us. Cheers. On today's show, Pat breaks the silence a little bit about his secret business trip yesterday and chats about Nick and Todd's trip down to Nashville to meet Mason Ramsey and his team. Also joining the show is former defensive end/outside linebacker and 2x Super Bowl Champion with the Patriots, Rob Ninkovich for a hilarious conversation. They discuss what he's been doing since he's retired, what the locker room was like in New England, and how his golf game is currently (14:41-34:45). Later, former Green Beret and long snapper for the Seattle Seahawks, Nate Boyer, joins the show. They chat about Pat's world record that Nate long snapped for, his foundation with Jay Glazer and what he's doing to help veterans and retired athletes, and his plan to climb Mount Kilimanjaro for 4th time (42:22-1:01:11). Pat also goes back into his playlist to choose a couple of Friday Bangerz to help send you into the weekend. Come laugh with us, cheers. Today's show is a loaded one featuring Pat, Nick, Todd, Digs, and Zito sitting down for three hilarious conversations. First, 5x Pro Bowler, 2x First-team All-Pro, 3x receptions leader and current assistant coach for the Houston Texans, Wes Welker, joins the show. They talk about the differences between Manning and Brady, what his coaching style is like, Wes recounts his incredible Kentucky Derby experience, and Pat explains the heat he would take on the sidelines after missing a tackle on a white returner (2:10-15:44). Next, former Ravens Pro Bowl RB and friend of the show, Justin Forsett calls in. They chat about his upcoming championship game in the AFFL finals and whether he thinks the amateur team has a chance, more about his experience going on Shark Tank with the Shower Pill, and Pat tries to convince him to record an album (22:54-33:13). To close out the show, 2x Super Bowl champion and former offensive tackle for the Steelers, Max Starks, calls in for an incredible convo. They discuss what he's been doing since he retired, the Le'Veon Bell situation, Big Ben being unhappy about his replacement being drafted, if he really had to borrow a pair of Shaq's shoes when he was in grade school in Orlando, and whether or not he's thought about slimming down since retirement (36:11-58:27). Come laugh with us, cheers.